Cigarettes should be made illegal ! Did you know that about 35% of adult smokers started when they were teenagers? Cigarettes are the easiest “drug” to get. I won’t call it a drug yet because it is not yet illegal. YET. Even though it is illegal too smoke if you are under 18. A lot of teenagers still smoke. Everyone can just go into any convenience store and buy a pack of cigarettes. Any teenagers can have access to those “deathsticks”. A cigarette is even more harmful than some illegal drugs. Marijuana also called weed or dope is illegal. Even though it has great medical uses; weed can slow down the production of cancer cells which is a deadly disease. Cigarettes are one of the main reasons why people get lung cancer and are still legal. Cigarettes hurt your lungs and turn them black. Cigarettes can even stop a person from doing sport. I don’t understand why cigarettes are still legal after all the death’s it caused around the world. Some countries have made cigarette very expensive to prevent the population to buy a lot but smoker will always come up with a way to find cigarettes. People smoke cigarettes all over the planet. The worst thing is that they don’t even know what they inhale. There are almost 400 toxic chemicals and 40 known to cause cancer. Cigarettes are also filled with nicotine; a very very very addictive substance. 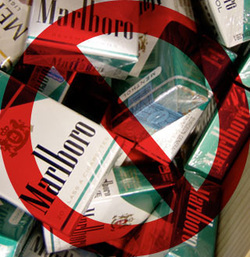 The companies put nicotine in cigarettes because it guarantees customer to buy more and more. A lot of job might be lost but it is worth saving thousand or millions of life isn’t it? Which leads to their own death. It is like people are paying to get killed painfully and very slowly. Nicotine is the reason why people still smoke after knowing the risks of smoking. This is why cigarette should be legal. People can stop after they started. Cigarette are technically about the same as junk food you enjoy eating/smoking them bout at the end you get obese which leads to diabetes or get cancer and die slowly and painfully. A cigarette doesn’t only harm the smoker. It also harms the people around him because of what we call second hand smoke. People can be “smokers” even if they have never touched a cigarette. They can get cancer from a friend smoker or just a random guy on the street. Cigarettes are like a weapon of mass killing. It kills people slowly and painfully. Every pack of cigarette now has a sign telling the harm of cigarette for your body. People still ignore that message and keep smoking until they get cancer.